Bill Fitzhugh, author of the novel, “Pest Control,” has a new book out that introduces characters created by Country music superstars Brooks and Dunn. Fitzhugh took time from his busy schedule to talk writing, and how he got involved with the band. Q - Your new book, “The Adventures of Slim and Howdy” is based off characters created by country music singers Brooks and Dunn. How did you get involved with this? A - Dumb luck, also known as being at the right place at the right time. The details are shrouded in mystery and I’m not at liberty to shed any light on them. The best thing to do is order you copy today. As a bonus, I understand they’re going to bundle a CD with a new song into the book. Q - Is this your story based off their characters or is it theirs that you helped put on page? A - Let’s just say they needed someone with typing skills and a skewed sense of humor. Oh, and at least one published novel set in the world of country music (that would be “Fender Benders”). Throughout the novel, the real lives of Brooks and Dunn merge with those of Slim and Howdy. It’s sometimes hard to say where one ends and the other begins but it’s worth reading to see if you can do it. Q - What is the book about? A - It’s about $23 in the US, $26.50 in Canada . But seriously folks… These two guys meet at a used car lot, both looking to sell. 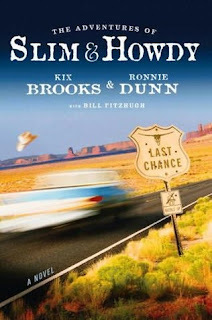 One thing leads to another and they decide to sell Slim’s car, keep Howdy’s truck, and ride along together for a while. They’re not together for 20 minutes before shots are fired, some shifty women get involved, and the fun begins. Before it’s over, a friend is kidnapped and Slim and Howdy have to ride to the rescue. Along the way they work the honky tonks, play some poker, and contemplate the perfect margarita recipe. 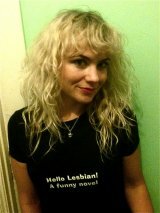 Q - Does it have that comical slant your other novels have? A - I have written two ‘types’ of comic novels: (1) the high-concept novel where an ordinary guy is dropped into bizarre circumstances and has to cope (“Pest Control”, “The Organ Grinders”, and “Heart Seizure”) where much of the comedy stems from the situation and the plot, and (2) more character-oriented stories where the protagonist is in a relatively normal world and the humor comes more from personality and dialogue (“Fender Benders”, “Radio Activity”, and “Highway 61 Resurfaced”). The comic tone of “The Adventures of Slim and Howdy” is more along the lines of the second type but only because I couldn’t figure out a way to work any transgenic baboons into a honky tonk in Del Rio, Texas. Q - Your books always seem to have a comic and crime theme. What is your background in these fields that allow you to write about such topics? A - While it’s true that I’ve made the acquaintance of law enforcement officials in several states my criminal past is embarrassingly modest and doesn’t really supply me with much to work with. But from childhood to this very day, I scour my daily newspaper for stories of dumb criminals. Something about the escapades of hapless nitwits has always tickled me. There being no shortage of these citizens (many of whom go on to re-election) I find the vein too rich not to mine. Q - How do you go about forming an idea and then putting it on page? A - Same way as anybody, I suppose. Think about it, toy with it, explore alternative answers to each question, each plot point, see how they play off one another, pick the one that works best. A lot of times the final story has very little in common with the original story idea. For example, I may know that someone will be kidnapped going into the story, only to have the details of the kidnapping (who did it, why they did it, etc.) change completely as I actually write it. In other words, I’m happy to let things change as they develop. Q -Describe a typical writing day for you. A - Take a pot of coffee to the office, get online, do email, read some news, then open the document and start writing. Begin by revisiting and rewriting whatever I wrote the day before, then move to whatever’s next. I frequently do online research as I write which often leads me wandering far off subject before I get back to the story at hand. If I have to figure a scene out, I might wander out to the backyard with the dogs, do some yard work while trying to figure out how best to structure the scene, thinking of dialogue, etc. I usually work all day, with these kinds of breaks, stopping in time to cook dinner. Unless I’m wildly inspired or under terrible deadline, I try not to write at night. A few times a week I will go out to The Way Back Studios (a building on the back of my property where I keep my stereo and record collection, and where I produce my XM show) and mull the larger aspects of the story, the forest vs. the trees, as it were. Q - Are you a guy that locks himself in a room when you write or do you need some type of commotion? A - I prefer silence but there is precious little of that here. Everybody on the street has dogs and others walk their dogs down the street and all the dogs have to bark, mine included. Then there are all the yard crews with mowers and the gas powered leaf blowers and then there’s the guy with the Harley who never seems to go anywhere; he just sits in his driveway revving the engine…. Noise canceling headphones help a little but not a lot. Q - How long does it typically take to write a novel? A - For me, from idea to research to first draft, it has ranged from 9 months to a year-and-a- half. Q - One of your books, “Pest Control,” started off as a screenplay before finding its way to novel format. Did you first want to be a screenwriter? A - I just want to be a writer. I moved to LA to write sitcoms or movies. I didn’t care which and I had no idea that other people DID care. Turns out, with a few exceptions, that if people in Hollywood think you’re one kind of writer they don’t imagine that you can be any other. The screenplay is a difficult form, more so than the sitcom. Novels are, perhaps, a bit more work but at the same time easier to write as they have no restrictions as compared to screenplays. I think the fact that I sold the film rights to the novel after producers at every studio in Hollywood rejected the screenplay tells you that the novel was a better telling of the story than the original screenplay. Q - How did you get into writing novels? A - After writing “Pest Control” as a screenplay and being unable to sell it, I read an article in the LA Times about a guy who had written a screenplay that he knew was good. Nobody was interested in it though, so he rewrote the story as a novel. He then sold the film and publishing rights to the book. So I decided to give that a try with “Pest Control.” Same thing happened. Sold the film rights, and publishing rights in five countries. Next thing I knew, I was a novelist. Damndest thing you ever saw. Q - I read (actually you had sent me the article) that “Pest Control” was in talks about being optioned to screen. What role will you play in this process? A - Actually, Warner Brothers (and the brilliant producer Paula Weinstein) bought the film rights before the book was published. The process I played was to deposit the check when it arrived. Alas the project has languished in development. More recently, however, a theatrical producer optioned the stage rights to “Pest Control” to develop it as a musical. It is also being developed into a German radio series by a company in Berlin . Q - How many rewrites go along with writing a novel? A - I tend to write and rewrite each chapter until it’s done. I don’t think I’ve ever written a chapter in one draft. I’d guess that each one goes through three to six drafts. Then I move to the next one. When I reach the end I have a good first draft manuscript. After that, depending on the editorial letter I get from my editor, the rest is mostly trimming as much fat as possible from the manuscript. I have, on occasion, (based on the editorial letter), gone back and changed some larger aspect of the story or a character. Q - How do you decide that you’re done with the rewriting process? A - Eventually you have to turn it in. The last due date is when you’re done. Given the chance, I could rewrite all my novels and improve them. Most writers I know say the same thing. Q - Explain the business side of writing. After the novel, how much work do you put in pitching the stories, query letters, and all that jazz? A - After writing your first novel, the first thing you have to do is get an agent. That takes a lot of persistence or luck or both. If you’ve got an agent who loves the book, your work is done in terms of pitching etc. It becomes the agent’s job to do all that. If the agent can’t sell it, he or she may drop you as a client and you have to start all over. Somewhere in the neighborhood of 136 agents rejected “Pest Control.” After I landed an agent, but before he sold it, I was working on the next book. He sold that too. Then I wrote proposals for two novels and he got me a four-book deal. The next two books were one-book contracts which I got based on a chapter and outline and my track record. Once you’ve got the contract, it’s all writing. Q - Is it easier now that you’ve had success or do you find it just as hard as when you first began? A - The writing’s easier because I think I’m getting better at it. The business side is out of my hands. People will either buy the book or they won’t. No amount of publicity (short of multimillion-dollar ad campaigns) is going to put you on the best seller list. We live in an age where the consumer ‘pulls’ what he/she wants from the entertainment media, as compared to the ‘old’ days when everybody watched the same TV channels, listened to the same radio stations, and read the same newspapers and the mass media could ‘push’ stuff into the mainstream. I don’t care how many blogs you do or how fabulous your website is or how many bookstores you visit, the consuming public is in control now. If you don’t spread like a virus (i.e., word of mouth, via the internet) and people don’t start pulling you into their lives and telling others to do so, you can’t push hard enough to make it happen. All you can do is write the best book you can. Q - What advice would you give to a writer who is trying to break into the industry? A - I’ve said it before and I’ll say it again: marry well or be born rich. Q - Do you follow certain rules when it comes to writing novels or would you say that you should write the book how you want to write it? A - I’d say the latter. I suspect I could sell more books if I wrote ‘straight’ crime novels but that’s not what I want to write. I can write unfunny but I prefer not to. Q - Anything else you wanted to add? A - For the past couple of years, I’ve been doing a show on XM’s “Deep Tracks” channel (channel 40). There are only three outside people who do shows on “Deep Tracks” – Bob Dylan, Tom Petty and me. How cool is that? The show is called “Fitzhugh’s All Hand Mixed Vinyl.” I put it together in an old building on the back of my property (we call it The Way Back Studios) where I keep my vinyl collection, two turntables, a mixing board and a CD recorder. It’s a half-hour long and is a throwback to the days of free form FM rock radio. I do two different types of shows, depending on what I happened to have come up with that week. 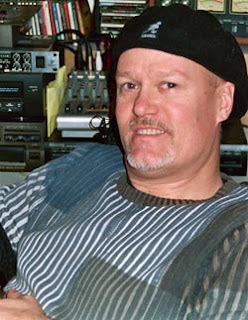 I work primarily with music from 1964 to 1980, artists we would have played on AOR (album oriented radio) stations in that time frame, i.e., a vastly wider range of artists than you hear on ‘classic rock’ stations. One type of show is simply to take songs of similar tone, mood, and style and sequence them in a way that flows or gains momentum as it goes along. That might be Willis Alan Ramsey into Jesse Winchester into Bonnie Raitt into Paul Simon etc. The other type of show is a more complicated mix of songs and parts of songs. For example, I recently took “God Bless The Conspiracy” by McKendree Spring (remember them?) and made a great set revolving around violin players. “God Bless The Conspiracy” consists of several ‘movements’ (for lack of a better word) and the lead instrument is a violin. So I found tracks by Jean Luc Ponty, It’s a Beautiful Day, Jefferson Airplane and others with strong violin parts. I segue in and out of “God Bless The Conspiracy” into these other songs and it’s sometimes hard to tell when one ended and the other began. In the middle of all this, I took Santana’s “Soul Sacrifice” and play it over a minute or two of the McKendree Spring. The percussion of the Santana matches perfectly with the electric violin and sound effects in the McKendree Spring. It’s a very cool mix. At any rate, it’s Tuesday mornings at 10 EST, 7 Pacific time and repeats Saturday nights at 10:30 EST, 7:30 Pacific.